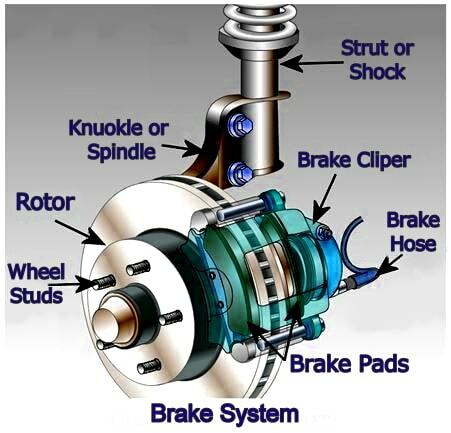 As you know brake safety is crucial in all cars so having brakes that work properly isn’t an option, it’s a must. Having your brakes serviced and checked 6 monthly intervals when your car is serviced is an excellent practice to get into. This way you won’t go for 12 months or more with a problem that is getting worse and worse and potentially endangering you and your family, and others on the road. The sound of brakes squealing is a sure indicator that there is a problem. Most likely the brake pads have been worn down and the metal discs are now grinding together. Letting this go for longer is likely to further wear down your brake rotors and cause major damage resulting in an expensive repair. As mentioned above brake pads are there to protect the rotors and also to make braking smoother. If you brake pads wear through and the brakes start making noises when you compress the brake pedal, then its time to come see us. Spongy brakes may be an indication of brake fluid leak or needing to be replaced. Brake fluid is a silicone based fluid which can become contaminated with moisture overtime. As water is corrosive rather than lubricating, the brake fluid loses its lubricating properties when full of water. Changing brake fluid at scheduled serves should relieve this from happening. There may also be a possibility that your brake fluid has leaked. This is common with drum brakes. A shudder in the car when braking is quite noticeable and a clear indicator that there is an issue with the brakes. The shuddering can be caused by warped brake rotors. This is caused by excessive heat and uneven brake pad wear (which is why it is important to have a when alignment and balance to ensure that the brakes pad wear will be even. To fix warped brake rotors, they can either re-machined or in some cases need to be replaced. Being able to stop at a safe distance quickly is vital to your safety and those in and around the vehicle. Having bad brakes is no excuse and is potentially fatal. Therefore a 6 monthly brake check along with your service will ensure your brakes stay healthy and can identify any problems early, avoiding costly repairs.